Sarah Cavender graduated from Philadelphia College of Art with a major in Sculpture. She creates these small sculptures for jewelry with brass screening, folding and forming to shape into flowers and bugs. Necklaces and bangle bracelets use filigree and rolled mesh. They are made in her small shop of local Alabama craftspeople, where each piece is individually plated or oxidized, handpainted with bronze powders in a base of lacquer, then sealed. The resulting colors are are more like metallic tints, that glisten and subtly transform in the bendable shapes. 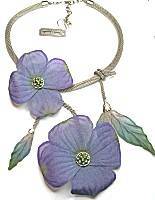 Masterpiece for your neck that features a pair of dogwood style blooms and accents of leaves on vine. They are suspended from 1/4 inch rounded silver finish mesh chain. Shepherd hook clasp, extender chain, 18-20 inches long. The flowers are 3 and 3-1/2 inches across, fine metal mesh is folded and curled in subtle shading of light purple into amethyst with apple green tips, a metal center is also accented in apple green. The leaf accents are apple green into dark aqua and silver gray. The elements are soldered into an artistic asymmetrical design, dropping about 5-1/2 inches at the center. 3 inches long including silver finish earwire, 11/16 inch across. The fine metal mesh is shaped with subtle leaf ridges, and colored in dark silver, violet purple and amethyst toward the tip. 3 inches long including silver finish earwire, 11/16 inch across. The fine metal mesh is shaped with subtle leaf ridges, and colored in dark silver, aqua and apple green toward the tip. 3/8 inch rounded open mesh tube has a trio of curved metal tubes running along it, they can be moved, but not removed, so you have style options! Shepherd hook clasp, extender chain, 16-18 inches long. The outer curve of the tubes has oval opening to reveal the mesh inside, the bottom center tube has cascades of interlocking rings forming an exotic tassel, 3 inches long overall. The metals are colored in green/aqua patina with coppery brass showing through. 3 inches long including patina finish earwire, 5/16 inch across. Flat cutout teardrops of metal are finished in patina green/aqua with hints of coppery brass, suspended from chain into a tower of tears. But lightweight and flirty to make you happy! A trio of metal mesh lilies with leaves span 3 inches of necklace front, 1-1/2 inches long, suspended from 7/16 inch flat antiqued brass chain that is most interesting. Shepherd hook clasp, extender chain, 17-19 inches long. The flowers are formed in fine metal mesh gently curved and folded with metal beads inside. The colors are graduated avocado green into dark aqua green and grayish grape purple. You can wear the flowers centered, or stylishly off to the side. 2-1/8 inches long including antique brass finish earwire, 7/8 inch across, fine metal mesh is shaped like petal of a lotus, colored in dark brass, avocado, and grape purple toward the tip. A 5/8 inch round lacy metal ring in antique brass finish has a metal mesh leaf draped over the bottom, 1-1/2 inches long overall. The leaf is colored in graduated shades of dark aqua into a bit of purple grape and dark brass. Surgical post at the top. Despite the metallic components, these earrings are light in weight! The 4-1/4 inch long pendant slides along the 1/4 inch rounded open mesh tube in antiqued brass finish (but cannot be slid all the way off). Shepherd hook clasp, extender chain, 19-21 inches long. Pendant has interesting filigree circles joined in classic design, filled with green and orange aventurine cabochons, a stripe brown horn at the top. 1-1/2 inches long, 1-1/8 inch across. Fancy antique brass finish metal filigree circles are soldered together and filled with cabochons of orange and green aventurine stones, a striped brown horn at the top. CLIP ON style for all ears. 2-5/8 inch long pendant is shaped like petal of an orchid with ridged edges, made with fine metal mesh and colored in black, dark orange and teal blue toward the tip. Suspended from foxtail woven chain that is black color, 18 inches long plus 2 inch extender links, shepherd hook clasp. 1 inch earrings formed by a curl of lacy metal metal mesh, colored in graduated shades of dark sage, blue and dusty pink. Surgical post slightly above center. A 7/8 inch round lacy metal ring in antique silver finish has a metal mesh leaf draped over the bottom. The leaf is colored in graduated shades of dark sage to blue, orchid and charcoal. Surgical post at the top. Despite the metallic components, these earrings are light in weight! A 7/8 inch round lacy metal ring in silver finish has a metal mesh leaf draped over the bottom. The leaf is colored in graduated shades of blue-green, to yellow-green to dark silver. Surgical post at the top. Despite the metallic components, these earrings are light in weight! There are 3 individual pieces with fancy silver metal bails that slide along the 5/16 inch round mesh chain, they move but will not slip off the clasp in back. But this flexibility makes a graceful necklace, featuring metal mesh that is colored gradually from blue-green to yellow-green and silver. The largest pieces are 2 inches long including bail. Shepherd hook clasp, extender chain, 18-20 inches long. 3 inches long including brass earwire, 2-1/4 inch long pendant is shaped like petal of an orchid with ridged edges, made with fine metal mesh and colored in antique brass, light brown and dark teal toward the tip. 1 inch across, lightweight! 2-1/8 inches long including silver finish earwire, 1-1/2 inch long pendant is shaped like petal of a lotus, made with fine metal mesh and colored in charcoal with bright purple toward the tip. 15/16 inch across, lightweight! Earrings are 1-1/2 x 1-1/8 inches, with brass filigree ring at top from which the pleated mesh petal extends. Colored in dark pink with antique brass, the shades gradually working into each other. CLIP-ON style for all ears. 3 inches long including gold finish earwire, 11/16 inch across. The fine metal mesh is shaped with subtle leaf ridges, and colored in dark gold into aqua dark turquoise toward the tip. 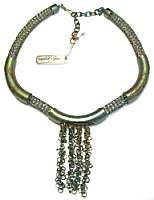 This metal handcrafted jewelry and accessories has been finished in a lacquer base bronze-oxide powder. It should be cleaned with a soft cloth or mild detergent only. Sarah warns that contact with solvent-based hairsprays and perfumes will damage the finish. With proper care, your accessories will last for untold years! Read about what others think of Sarah Cavender jewelry! Instead of reviews for a specific product, this is a place to share about the designer line in general.